Another Greta Helsing book for the win! And if its even possible, this one was even more enjoyable than her first book, Strange Practice. 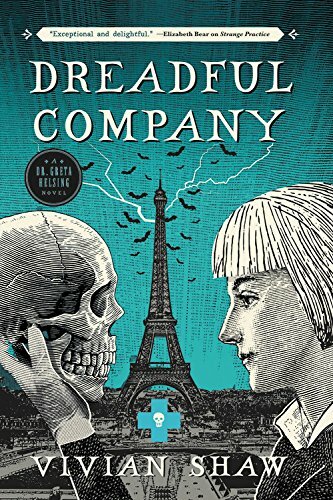 Greta and Ruthvan are in Paris for a series of medical conferences when she begins to notice what she deems, peculiar happenings. For starters, strange monsters keep making their way into her hotel room, a well monster and hair monsters (harmless creatures really, but unusual nonetheless). After Ruthvan flies out of Paris, Greta decides to ease her mind and reach out to the guardian of the city, St. Germain (a werewolf) to get his take on the strange little creatures. Before she is able to make it to her appointment however, Greta is kidnapped and taken to an underground prison cell by a vampire leader with a decades old vendetta against Ruthvan. Greta is to serve as bait in order for this vampire, Corvin to exact his revenge. Meanwhile, someone is practicing magic to summon these little monsters, and in doing so is tearing the fabric of reality. Alone and with only her wits, Greta hopes her friends realize shes missing, before she becomes more meal than bait in his coven of hungry vampires. And time is of the essence as reality is splitting and may not be able to be held together for much longer. SUCH. A. GOOD. BOOK. Greta and her posse are really like a group of old friends by the end of this book. At only the second in the series I feel like I know them all so well. They are comfortable and familiar and I could read about their adventures forever and not tire of them. Greta is such a great MC; She is smart, witty, and cunning in a way that isn’t devious but more so resourceful. She is the damsel in distress who doesn’t need saving. She buckles down, uses her brain, and saves herself. She is brave and headstrong, someone you definitely want in your corner when trying to save the fabric of reality. The blooming relationship between her and Varney is swoon-worthy (yes I swooned) and the addition of a few new characters to the group was fun. In addition to the baby ghouls from the last book, I have decided I would also like to add a well monster and a hair monster to my list of supernatural creatures I would like to meet/keep as pets. (How can you resist that siren cry of “glup” and the fuzzy hair monster snuggles?!) The book was full of action, friendship, love, and redemption and I cannot recommend it enough!